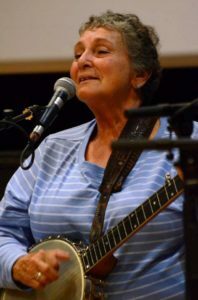 Sara Grey has been playing banjo for over 58 years. Her dad, from northern NH, played fiddle and he took Sara down south when she was young back in the early 50’s to watch some of the “old boys” play and sing. She took that knowledge back up to NH where she grew up,and played for square dances when she was still in school. She has been playing ever since….dividing her time between the states and Scotland. She has taught wherever she has lived and at many traditional music camps and schools. She presently lives in Rockland,Maine where she teaches several brilliant students. She has performed solo and with her son,Kieron Means for many years all over the world. Her strength is to use the banjo for song accompaniment as well as for tunes…both frailing style and two finger picking.